Arturia's first true hardware synth aims to let you conveniently create your own modular system from modelled components of some of the best-loved analogues of all time. How well does it realise this ambitious goal? Imagine being able to take the oscillator and filter modules from synthesizers such as the Minimoog and ARP 2600 and converting them into self‑contained software modules. Next, throw in a bunch of generic control modules and design a framework into which these can be inserted and cross‑connected, and house the whole thing in a powerful signal processor with all the hardware needed to program and use the thing. Voilà, mes amis — the Origin! 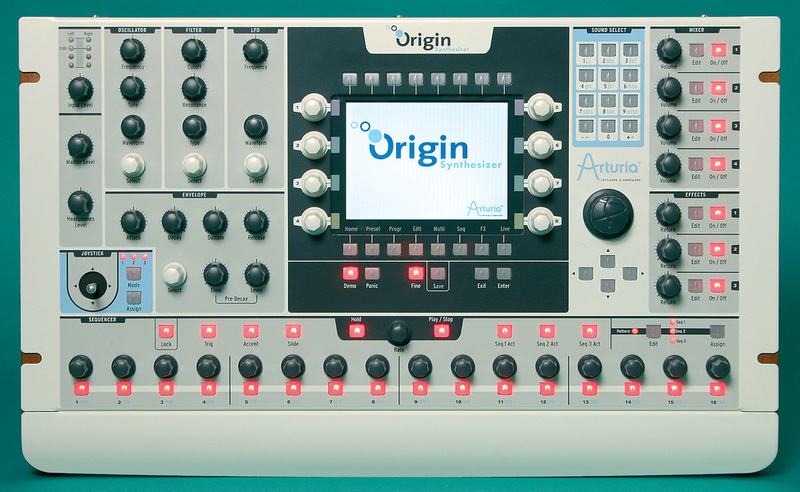 The Origin is more than just a synthesizer. Like many modern instruments, it provides a Program mode for building sounds, plus a Multi mode for combining them in splits and layers, and for multitimbral use. There are effects processors accessible in both modes and, although there's no multitrack digital sequencer on board, there is an analogue‑style sequencer and arpeggiator. Consequently, the Origin is best described as an 'analogue style' workstation. Physically, it's a substantial lump. With more than 50 rotary encoders, 12 of which can be used as push‑button selectors, more than 80 buttons, a spin wheel (which is also a push-button) and a joystick, it needs to be. To be fair, its size and the number of physical controls is a blessing, because it reduces the amount of farting around that would otherwise be necessary to create and manipulate sounds. Having said that, the Origin still demands a considerable amount of farting around, especially to build and refine new synthesizer architectures from scratch. Remember, this is a modular synth, so you have to configure new 'instruments' before you can create sounds with them. To illustrate this, let's build and program a simple synthesizer architecture. The Origin interface offers eight primary editing pages (most of which have additional sub‑pages), accessed by the eight buttons that run along the underside of the screen. These are the Home page, followed by the Preset, Program, Edit, Multi, Sequencer/Arpeggio, Effects and Live pages. 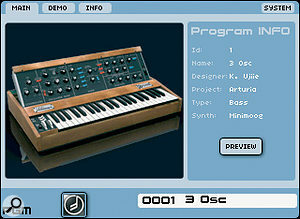 To create a new synth from scratch, start by entering the Preset page and selecting the Empty Program option. This then takes us to either the Edit/Patch or Edit/Rack sub‑screen, depending upon which was used most recently. We'll start in the Rack screen, which offers a representation of a modular synth with three rows of eight slots, only two of which are populated: one with a keyboard control module and the other with an output module. We can now insert an oscillator by pressing Add, scrolling to the oscillator list, and selecting from five options: Origin, ARP 2600, Yamaha CS80, Minimoog and Jupiter 8. There's a sixth option — a Wavetable oscillator — but this, for reasons that are beyond me, is presented separately. For the sake of argument, let's select a Jupiter 8 oscillator. No matter where you have placed the cursor within the 8x3 grid, the oscillator will now appear (sensibly) between the keyboard and the output modules. If we now press a key on an attached MIDI controller keyboard, no sound ensues. This makes sense. Like a true modular synth, the oscillator is in position, but it's not connected to anything, so we need to patch the keyboard controller to the oscillator's FM input, and the oscillator's audio out to the input of the output module. If this were a true modular synth, there would now be a continuous drone, but there isn't. Instead, if you play the controller keyboard, the sound is produced with a square 'organ' envelope. This means that there is an amplifier in the output module, controlled, in the absence of an envelope, by the keyboard's Note On and Note Off messages. All of the Origin's I/O connections are found on the recessed rear panel.Let's now add a second, slightly detuned oscillator by repeating the previous operation and making the appropriate connections. Well, we can't; we have to add a mixer and patch the two oscillators to its inputs, then direct the mixer's output to the Output module. This, again, makes perfect sense but, strangely, the mixer does not locate itself between the oscillators and the output module. This is not an impediment to programming, but it's confusing. Happily, we can obtain a more pleasing arrangement by jumping to the Edit/Patch screen, which offers a 6x5 matrix of modules within which we can move the modules to any desired position. (That's weird — one representation offers 24 modules, the other offers 30!) Selecting the mixer in this view, we can move it and connect it as desired. The patch now shows its interconnections on‑screen, with differently coloured lines to differentiate between different types of signal (audio, CVs and so on). We can now continue to add modules, creating complex audio paths and cross‑patching modulation sources pretty much at will. What's more, unlike most modular synths, the Origin's modules allow us to direct single audio signals and CVs to multiple destinations, and their inputs can receive from multiple sources. This is equivalent to having a 'multiple' on every output and a mixer on every input, vastly increasing the Origin's patching capabilities. Avoiding the temptation to go wild, I completed this simple architecture by adding a Jupiter 8 low‑pass filter, from the resonant high‑pass, low‑pass, band‑pass and notch filter options, adding an envelope generator and, finally, an LFO. I then removed the pressure sensitivity that was engaged by default, created a suitable filter sweep and added a little pitch modulation. The result was warm and engaging, and on many levels was no different from a large analogue synth. I was impressed. To the far right of the panel, you'll find the Origin's three effects slots. Each can host the same five algorithms: chorus, delay, reverb, distortion and a dual phaser, each with MIDI sync where appropriate. Routing (accessed via the Program/Mixer page) is sophisticated, with series, parallel and independent (ie. per output) options and, with certain exceptions, you can place any three of the effects in the slots you require. However, there's nothing sophisticated about the algorithms themselves; they are of the stomp‑box variety so, if you want exotic and power‑hungry effects, you should use the independent audio outputs provided by the Origin. These allow you to direct each sound to the external processor(s) of choice. Running along the whole of the bottom edge of the Origin, you'll find the 16‑step sequencer — except that it isn't. 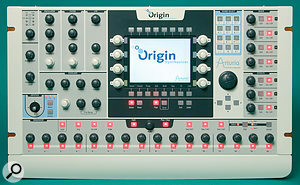 Although only one row of 16 knobs is provided, the sequencer offers three rows of sequencing, each with up to 32 steps. There are lots of facilities on offer — quantisation, swing, accents and so on — and you're not limited to creating note sequences; you can direct the sequences anywhere within the patch. So if you want to direct sequence 1 to the pitch inputs of two out of four oscillators as well as the pan and the rate of LFO 1, connect sequence 2 to the filter FM, the LFO 2 rate and the envelope Attack rate, and sequence 3 to, oh, anything else you want, you can do so, just by adding connections. There's also a simple arpeggiator. This follows the Roland model, with up, down, up/down and random modes across one, two, three, four or five octaves. If you're after the fairy‑dust sounds of arpeggiated Jupiter synths, you can have it. Alternatively, crank a bit of distortion into a Minimoog patch and run the arpeggiator, and ELP's 'Karn Evil 9' is never far away. The Home page allows you to browse through, select and preview patches. It is also the starting point from which — by pressing the System button — you enter the Origin's extensive editing system.Pressing the 'Progr' button takes you to a set of five pages, one of which (the FX Mixer) I've already mentioned, and the other four of which are devoted to advanced modulation duties. The first of these is a five‑stage, two‑dimensional envelope generator. Originally developed as the basis of Sequential's Vector Synthesis, this provides a phenomenal amount of control, and careful programming can yield some remarkable results. The next page contains a version of Arturia's Galaxy modulator. When I first reviewed this on the Jupiter 8V I was a little sceptical about it, but I soon found that it had a unique ability to generate all manner of cyclic and/or discontinuous modulations. Inevitably, the majority of effects you obtain from this are, well, just effects, but with a bit of planning it too can create some remarkable sounds. The other two pages contain global LFOs. These offer the standard waveforms, plus niceties such as waveshaping for the triangle and square waves, sync, delay and fade‑in time. There's lots of control over the parameters and, as always, the output can be directed to multiple destinations. Simple? Yes, but not limited. Before moving on, I also have to give special mention to the Joystick Mixer. Similar in concept to the 2D envelope generator (and, again, descended from the Prophet VS) this allows you to assign up to four audio inputs from anywhere in the synth, add two modulation sources, and then direct the output to multiple destinations. Control over the sound is then provided using the joystick, or by triggering another two‑dimensional contour. Again, the amount of control can be astounding. The Edit/Patch screen allows you to insert and remove modules, to move them around into sensible configurations, and to see what's connected to what. This gives you the best view of the architecture of your virtual modular synth. Having created an architecture and programmed some sounds, Multi mode allows you to access up to four of them simultaneously. Each program can be allocated its own MIDI channel, transposed by up to +/- 24 semitones, and restricted to its own range of MIDI Note numbers so, in addition to creating splits and layers, this mode is perfectly suited to four‑part multitimbral duties. It was while investigating this that I really started to appreciate the Origin. Firstly, I discovered that edits made to Programs in Multi mode could be saved when saving the Multi itself. (This might seem a subtle point, but it's a huge benefit when compared with synths that demand that you edit and save the constituent Programs independently from the composite whole.) Then, quite by accident, I layered one of my arpeggiated Minimoog programs with one of the factory presets, a slow pad called 'Seqpadbell'. Jean Michel Jarre would have sold you his granny for this combination, and I suspect that, with a bit of haggling, you could have got Charlotte Rampling thrown in, too. Next, I decided to make the Origin crash, so I added a third, CPU‑hungry polysynth pad to my Multi. This comprised a dual‑oscillator synth played through a heavy phaser sweep. The Origin did not crash, but the mildly distorted arpeggio continued to be mildly distorted, the Seqpadbell patch continued to be delayed, chorused and reverberated, and my new strings pad continued to be phase‑shifted. In other words, Multi mode is genuinely multitimbral, and the patches that you insert are reproduced with all their effects intact. I can't tell you how happy this makes me! Well done, Arturia. Still trying to crash the Origin, I inserted an analogue drum sequence into the fourth and final slot. Don't be misled, the Origin does not have any analogue drum sounds other than those you program, and it doesn't have a drum sequencer. Nonetheless, you can do quite a lot with the existing sequencer, so I tried to see whether I could do the whole Oxygene thing in a single Multi. Amazingly, I could, and still the Origin refused to hiccup, let alone fall to the floor in a pile of over-stressed digits. The only thing I noticed was that I had hit the CPU limit, because the polyphony — which has a maximum of 32 — had dropped to just four. I might have been able to lessen the CPU load by replacing the somewhat greedy Minimoog and Jupiter 8 modules I had used with the more abstemious Origin modules, but no matter — by this point I was simply having fun. The Edit/Rack screen doesn't show the interconnections between modules, but it allows you to see what's happening on the synthesizer's virtual 'control panel' and to tweak the knobs and sliders much as you would on a physical modular synth. Arturia make a big deal of their oscillators, claiming that their TAE technology, "allows the production of totally aliasing‑free oscillators in all contexts.” For those new to the term, aliasing is a side-effect that occurs when digital devices attempt to handle signals — input from the outside world or generated internally — whose bandwidths exceed that of the system. In almost all cases it results in the generation of spurious frequency components that are unrelated to the wanted audio, and can result in clangorous and unpleasant sounds. Arturia's words are an over‑statement, but significant aliasing is generated only in the Origin oscillator. Given the low CPU load of this module (ah, that's where the processor 'cost' was saved) that's not surprising, and quite acceptable. Nonetheless, you may wish to be aware that the facilities of the imitative oscillators step well beyond their inspirations and do not model them precisely. For example, the Minimoog oscillator offers distinctly un‑Minimoog‑ish facilities such as PWM (which, not being a purist, I think is a good thing) and its square wave has a duty cycle of 47 percent, which might emulate a Minimoog in Grenoble, but is not the same as mine. Further anomalies are present in other modules, but whether these worry you or excite you will be determined by whether you choose to approach the Origin as an emulator or as a new instrument in its own right. I veer toward the latter. Moving on from the virtual analogue oscillators, I want to praise the wavetable oscillator, a collection of 96 waveform snippets modelled on the Prophet VS ROM. You can insert four of these into a single patch and control them using the joystick mixer and the 2D envelope in a manner that's very similar to the original. I very much liked the sounds I obtained from this and, given that the VS is still one of my favourite synths, this is no small accolade. Let's now talk about the Envelope module. Described by Arturia as an ADSR this is actually wrong, and the manual is very poor at describing it. The contour generated is, in fact, an H1‑A‑D1‑H2‑D2‑S‑R envelope, similar to that found on some (digital) Korg and Yamaha synths. In other words, it has a Hold stage before the Attack kicks in, and two Decay stages with a definable hold duration between them. What's more, as well as being able to modulate the various A, D and R (Release) times, you can adjust their shapes from linear to something akin to logarithmic, which means that you can imitate the various responses of many classic synths, and even approximate the unusual envelopes of Yamaha's CS‑series. So while only one envelope module is provided, it can emulate many of the subtleties of the four vintage synths on which the oscillators and filters are based. Arturia should make much more of this in the Origin's manual and marketing materials, it's good stuff. Moving on to ease of use, the Origin is not the easiest of instruments to master, but it's well thought‑out and straightforward once you get to grips with it. For on‑stage performance, Arturia have even provided a 'Live' page that allows you to map the most important parameters to the eight programmable knobs on either side of the screen, as well as to the joystick and the other control-panel knobs. Given the limited number of suitable knobs in the oscillator, filter, LFO and envelope sections, this is not a luxury; it's a necessity if you want to tweak multiple elements of the sound as you are playing. The Minimoog template sits on top of an Origin configuration that is similar in form and sound to a genuine MInimoog, and it encourages you to create and play patches as you would on the original synth. Extra LFO and modulation capabilities are tucked away behind their respective buttons at the top of the screen.But what about the sound? Given that you can't create an exact copy of any of the synths from which the Origin draws its inspiration, can it sound like any of them, or are its sounds just a mish‑mash of analogue timbres? The answer is a bit of both. You can force the Origin to sound much like a Minimoog or a Jupiter 8, but I preferred to create sounds that I couldn't obtain from any existing synths. An example? I placed three oscillators in a Memorymoog type of arrangement, but instead of choosing a Moog‑style filter, I placed a couple of the CS80's 12dB/oct low‑ and hi‑pass filters in the audio path. The result sounded neither like a Moog nor like a CS80; it was a new synth with its own character. To be honest, there's much more that I would like to discuss here, but there's no room to do so. Consequently, I must apologise for overlooking the Bode Frequency Shifter, the audio inputs that allow you to treat external audio as if it were generated by an oscillator within the Origin, the 'Stereo Filter' and 'Crazy FX' templates that take advantage of these inputs, the MIDI and System pages, the sound search facilities, the factory sounds, and much more. I would also have a moan about the placement of the brightness and contrast controls, which are covered (!) by the wooden end‑cheeks. However, there's just enough room to report that, in the end, I managed to cause a problem (although not a crash). I was removing modules from the Edit/Patch page while playing, creating some rather nasty, and understandable, clunks while doing so, and suddenly the Origin fell silent. I could still move around the pages and edit, but no matter what I did, no sound was forthcoming and I had to switch it off and then on again to restore things to normal. If that's the only way to cause it to hiccup, the Origin is a remarkably stable piece of kit. The sequencer section offers three rows of virtual CVs plus an arpeggiator, each with a dedicated editing screen. The overview screen allows you to see all three sequences simultaneously, helping you to understand how they are interacting. The Origin is not a hardware implementation of existing soft synths, and it should not be approached as such. 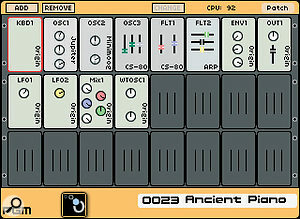 Yes, it draws upon aspects of vintage synths, but the number and range of modules provided is much less than a complete butchery of the original instruments would produce, and it does not slavishly emulate any of them, instead allowing you to create new synth architectures and sounds using the modules as building blocks. This synth can create fabulous sounds that are reminiscent of a Minimoog, an ARP 2600, a Jupiter 8, a CS80 or a Prophet VS, but I am more impressed by its ability to step beyond these. If you like the idea of modular synthesis within a digital environment, the long‑discontinued Nord Modular and Micro‑Modular allow you to concoct synthesizers of great complexity using a wider range of modules than is provided by the Origin. These change hands for very reasonable prices, and although they make no pretence at analogue emulation, they remain superb sound-design tools. Once set up and edited, these can be played as stand‑alone instruments, although editing is carried out on a host computer, so they are not self‑contained in the same way as the Origin. At the other end of the spectrum, you might like to consider the Use Audio Plugiator, reviewed in the March 2009 issue of SOS. This also uses a computer as a host editor, and is also self‑contained once loaded with the sounds you want to play. However, unlike the Nords, it supports a good range of 'plug‑in' vintage synth emulators, although it does not offer the modular approach of either the Nords or the Origin. So is the Origin unique? I suspect it is. Other products overlap aspects of its operation (you could even consider PCs in a box, such as the Neko 64 and the Korg OASYS) but if you want to do exactly what it does, it's currently the only game in town. 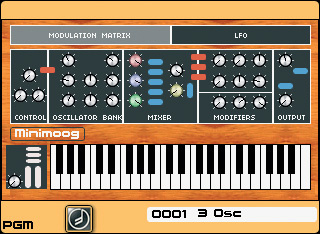 If you want to create sounds on something that looks like an existing synthesizer, the Origin features a Minimoog template that offers the appropriate modules correctly configured to enable you to program and play it like the original. 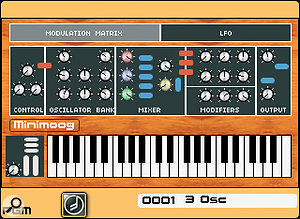 As you would expect, it includes three Minimoog oscillators, and the controls appear to emulate those of the real synth. However, all is not as it seems. For example, there's oscillator sync and, while the envelopes appear to generate the Minimoog's ADSD contours, the Release knob on the physical control panel also controls the release of the sound (which, of course, is wrong). Furthermore, there's a dedicated LFO, a modulation matrix, and polyphony. Strangely, given the quality of much of the Origin software, there are two obvious bugs in the template. The manual describes the modulation matrix as eight‑slot (it has only six slots) and the Unison mode described isn't present. Notwithstanding these niggles, I'm rather glad of the additions to the template, because they defuse the inevitable question, "ah, but does it sound identical to a real Minimoog?” I prefer to view the template as a visual programming aid that enables players to recreate many Minimoog‑esque sounds (which, to answer the question, it does well) and to program advanced sounds that use the Minimoog architecture merely as a starting point. There are no factory template for the CS80, Jupiter 8, ARP 2600 or Prophet V at the moment. The manual promises these for the future, but I thought that I would try to build a CS80 for myself. At first, everything went well as I created the two separate audio paths needed, each with independent high‑pass and low‑pass filters, dual envelopes and LFOs, plus global ring modulation. But by the time I had inserted all the modules, the CPU meter was reading way over 100 percent and the Origin had muted itself. Not for the first time (and not for the last) I realised that the Origin is not Arturia's V‑series soft synths in hardware form. 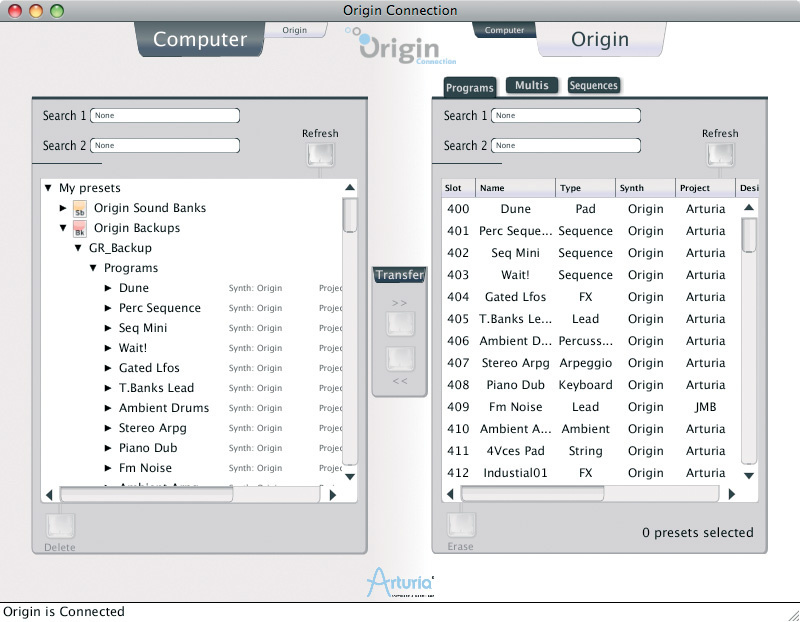 The Origin Connection software runs under OS X and Windows (XP and Vista) and provides two sets of facilities: sound/sequence storage and firmware upgrading. Connecting the Origin to the computer via USB 2, I expected the software and synth to synchronise themselves almost immediately, but the delay was rather longer than I had expected. However, once up and running, the backup/librarian functions seemed to work correctly, although I found details of the user interface rather inconsistent. This doesn't affect the sounds, but I think it could be tidied up a bit. 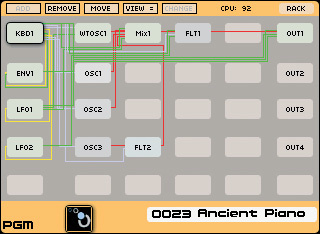 You can also use this software to cross‑connect two Origins, to swap sounds between them. Obviously, I was unable to test this, but I have no reason to believe that it wouldn't work as promised. Weighing in at 8kg, the Origin is a chunky, 6U affair designed for tabletop use, but you can also remove its front lip and wooden end‑cheeks for rackmounting. The hardware is solid, and the high‑resolution colour LCD has a good range of viewing angles. (Wouldn't it be nice if it were touch‑sensitive, though?) The only thing that I would criticise about the design is the choice of an external power supply, and an odd one at that. Rated at 6.5V and providing a massive current of 3.85A, I have never seen its like before. If it fails, you're extremely unlikely to find a replacement in the local electrical store. Two quarter‑inch main audio outputs. 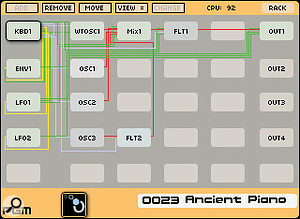 There are currently 20 types of module from which you can build synthesizers within the Origin. Notwithstanding the CPU limit, which can be exceeded more quickly using some modules than others, there appears to be a hard limit of 20 modules that you can insert at any given time. There are also sub‑limits, such as nine oscillators, four filters and four mixers in any given program. 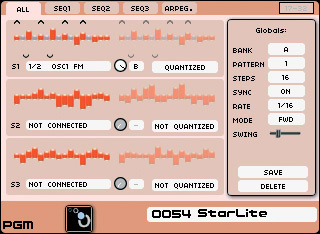 The three effects slots, FX mixer, 2D envelope, Galaxy module and global LFOs are always available. 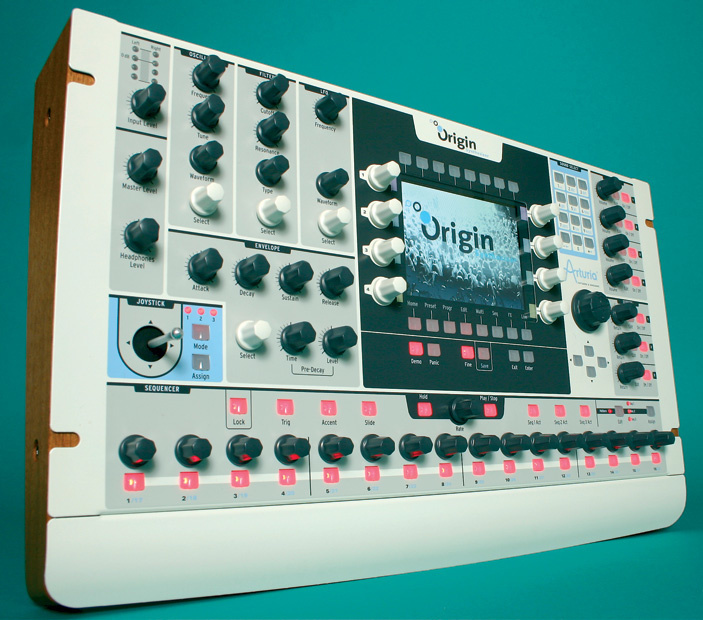 Here's a list of the Origin's modules. 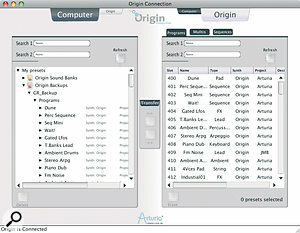 The Origin has space for 1000 Programs, of which 400 are preset factory sounds, and for 256 Multis, of which 100 are preset. These range from relatively simple and often very usable emulations of vintage analogue synthesizers to complex soundscapes comprising multiple layers of sequenced and arpeggiated 'virtual analogue' patches. I wasn't a huge fan of the more complex factory programmes and preferred to create my own (simpler ones) during the course of the review. Nonetheless, I have no doubt that other players will be happy to use many of the sounds on offer. Generates a rich, involving sound. The effects are truly multitimbral. Hurray! The external PSU would be hard to replace. The manual is rather lacking in places. 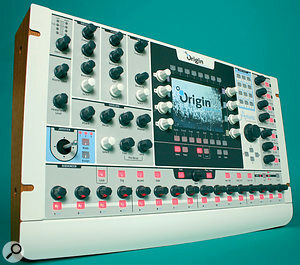 The Origin is a unique instrument, combining modular virtual analogue synthesis derived from imitative soft synths with modern features such as splits, layers and truly multitimbral effects. It sounds excellent and, if you can afford it, you should take a close look, because there's nothing else that does quite the same thing.